A major winter storm has developed in the central U.S. and is set to makes its way east Saturday, targeting more of the Midwest, the Ohio River Valley -- and eventually the East Coast. The storm has already claimed at least three lives as a result of car accidents in Missouri, according to the state's highway patrol. 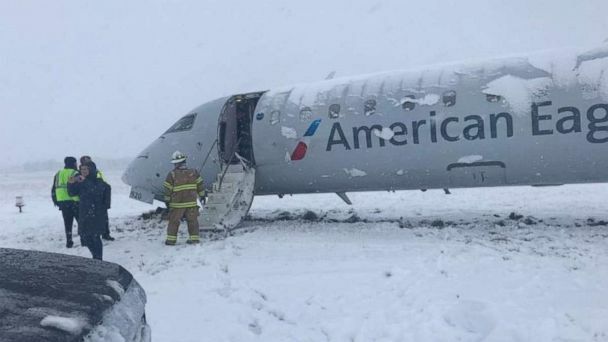 Also in Missouri, an American Airlines regional jet partially slid off the tarmac while taxiing off the runway in Columbia, Missouri. No one was injured. Columbia had already received over 10 inches of snow in the storm as of early Saturday morning, with Belleville, Illinois, receiving 6.8 inches and Garden City, Kansas, at 6 inches. Radar shows a large snow shield extending from western Kansas all the way to the Appalachian Mountains in Virginia and North Carolina on Saturday morning. The heaviest bands of snow moved over eastern Kansas, most of Missouri and central Illinois around 5 a.m. with snowfall rates of 1 to 2 inches per hour. The snow affected travel on Interstate 70, Interstate 44 and Interstate 55. Winter weather alerts stretch from Colorado to southern New Jersey Saturday morning and include major metro areas like Kansas City, Missouri; St. Louis; Indianapolis; Cincinnati and Washington, D.C.
During the day Saturday the storm will slide a little eastward, with the snow stretching from Missouri to West Virginia, and heavy snow bands impacting much of the I-70 corridor from St. Louis to Columbus, Ohio. Snowfall rates could exceed 1 inch per hour in this region, and winds may gust over 30 mph in spots. Low visibility will make it very difficult to travel in this region Saturday. While the storm looks fairly significant Saturday morning, it will struggle to intensify as it moves toward the East Coast. Regardless, some locations in the mid-Atlantic will see at least some snow, including locally significant snow in some areas. Cold, dry air in the Northeast will likely eat away at the storm and keep the activity from moving northward Saturday night into Sunday. The latest computer guidance shows a round of snow moving into northern Virginia, much of Maryland and parts of New Jersey overnight into Sunday morning. This is slightly further north than the forecast model showed Friday. Travel will be difficult Sunday morning on parts of the I-95 corridor through Maryland and northern Virginia. Northern Virginia and southern Maryland could see a few intense snow bands, which could help increase their snowfall totals. Some insignificant snow is possible in Pennsylvania and New Jersey. Additionally, a new low pressure off the North Carolina coast line will help increase moisture in parts of the Carolinas and Virginia. Moisture running up against the cold air over the southern Appalachians will cause some mixed precipitation concerns from Roanoke, Virginia, to Asheville, North Carolina. It is likely that there will be ice accumulations. By Sunday afternoon, the coastal low begins to pull much of the moisture away from the East Coast, with much of the snow activity concentrated in northern Virginia and much of Maryland. It is worth watching how close some of the offshore bands of snow make it to New Jersey and southern Long Island. The updated snowfall forecast shows the highest totals along the Missouri and Illinois border, where 6 inches or more of snow is likely. On the East Coast, the highest totals are still expected in northern Virginia and parts of Maryland with 3 to 6 inches possible locally. Some snow accumulation is possible in parts of New Jersey and Pennsylvania, but it appears snow totals will be low. On the West Coast, the next in a series of storms is arriving in California Saturday morning. Heavy rain moves into Los Angeles and San Diego with rainfall rates at times approaching half an inch per hour. Another storm will arrive in Southern California on Sunday night, and another one will sneak in right behind it early in the work week. Several rounds of rain will likely dump 4 to 6 inches of rain on parts of Southern California. Flooding, debris flows and mudslides will become an increasing concern as more and more storms target this region in the coming days. Additionally, heavy mountain snow is expected for the entire Sierra Nevada range, and parts of the mountains outside Los Angeles.